In October 1962, Air Commodore Y V Malse (1616 GD(P)) was with the National Defence College when he got urgent instructions to go to Eastern Air Command HQ as Air HQ's Special Liason officer. The Indo-China war had broken out at that time. His observations from that era are narrated here in an oral interview from 2003. How the Indian Air Force came close to destroying eight of its own Jet fighters during the 1962 war. The first ever attempted "Scorched Earth" order in history. Based on the recollections of Air Marshal Trilochan Singh. The first landing at Nyoma was ostensibly carried out by an An-32 in 2009, but lost among the records are the details of a flight carried out 47 years later - Now a photograph has surfaced proving the first landing in 1962. Wg Cdr Joseph Thomas, VM was a young flying officer serving with No.43 Squadron in Ladakh during the 1962 war with China. His experiences during the outbreak of the war are narrated in this article. Glimpses of the Role played by No 110 Helicopter Unit, IAF in the Chinese War of 1962 – NEFA Sector: A Tribute by Air Cmde Melville Rego, who participated in the war with the unit as a rookie Signals Officer. Gp Capt Anant Bewoor argues in this article that the IAF was not fully prepared for providing Close Air Support over the battlefields of the 1962 War. After his flying accident in a Spitfire in WW2, which kept him from flying for some years, Wg Cdr Patel went on to the Joint Services Wing (JSW) at Dehradun. The JSW was later transformed into the National Defence Academy at Khadakvasla near Pune. Wing Commander (Retd) Venugopalan "Venu" Kondath continues on his experiences in the Indian Air Force. In this installment - he writes about flying in Dakotas of with No.11 Squadron "Rhinos" in the north east frontier agency. Arnold Socindronath Williams was commissioned in the Indian Air Force in October 1950. 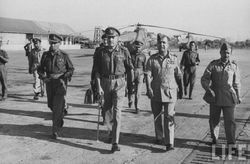 Originally trained on Transports and Heavy bombers like the Liberators, he later moved to helicopters and was the commanding officer of No.105 Helicopter Unit during the run up to the 1962 War. In this article he writes about two of his sorties from those times.